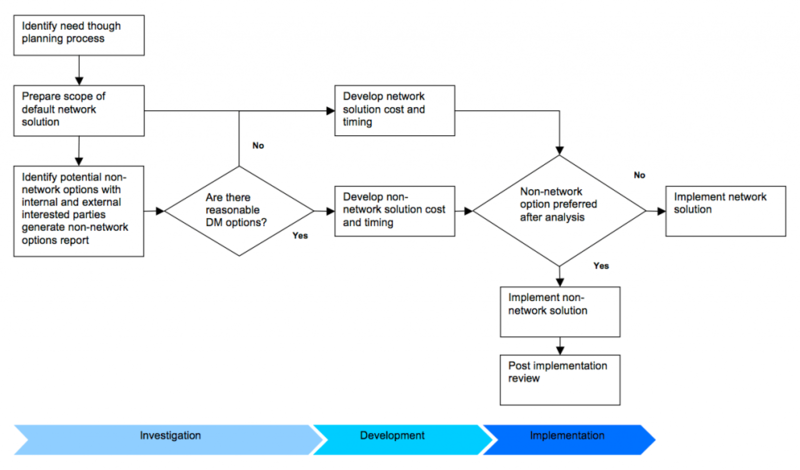 The Demand Management Process is how we investigate, develop and implement non-network projects to meet load requirements. As part of the transparent process, we develop a report to let everyone know how our network is coping with customer demand and increased or decreased loads. The Annual Planning Report estimates the expected capacity and demand at each zone substation and on each sub-transmission line over the next five years. The report also provides a summary of major works being proposed on the network over the same five-year period. To help us with our network management, we keep a list of Demand Management Interested Parties. We consult these parties whenever we want non-network options or ideas, so you’re welcome to register at any time. Of course, if you have any advice or ideas for projects that follow our process, then we’re always ready to listen. CitiPower and Powercor have provided the Demand Side Engagement Strategy below to assist non-network providers in understanding our framework and processes for assessing demand side options. This engagement strategy also discusses our consultation process with non-network providers and their integration into our planning processes. As consumers generally continue to require more electricity to meet their needs, non-network providers are having an increasingly important role in the supply of electricity. Where technically feasible and economic, non-network options have the potential to meet rising demand at a lower cost to consumers. This engagement strategy provides information on how CitiPower and Powercor will engage with non-network providers and how it will consider non-network options.